The latest Android Pie for Essential PH-1, is available to download and install via custom ROMs like Lineage OS 16. This is a step-by-step guide on how to install Android Pie on Essential PH-1. – The Essential PH-1 (codename: mata) has got official Android Pie. – This Android Pie update for Essential PH-1 lists all available options including custom ROM such as Lineage OS 16. – Installing a custom ROM or even the stock firmware manually requires little bit advance knowledge of operating and modify the firmware of an Android device. 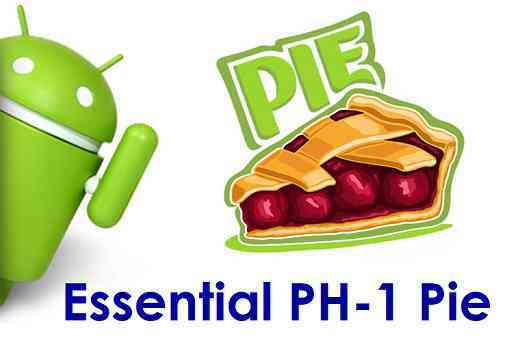 Download one of the Android Pie ROMs available for Essential PH-1 from the above list. Download the TWRP recovery for Essential PH-1 from the downloads list. Install TWRP Recovery on Essential PH-1 using fastboot. Then, download one of the Android Pie ROMs available for Essential PH-1 and copy the file to your phone using TWRP MTP mode or sideload. Reboot your phone and enjoy Android Pie on Essential PH-1. If you are facing any issue while following this guide, then you can comment here or you can create a topic on the Essential PH-1 (mata) Forum or on the respective Android Pie, LineageOS 16, Android Oreo Custom ROM topics.